Amir Khan (left) defeated Devon Alexander on Dec. 13. Less than a week after one of the biggest victories of his boxing career, former light-welterweight world champion and Olympic silver medalist Amir Khan experienced a profound sense of loss. 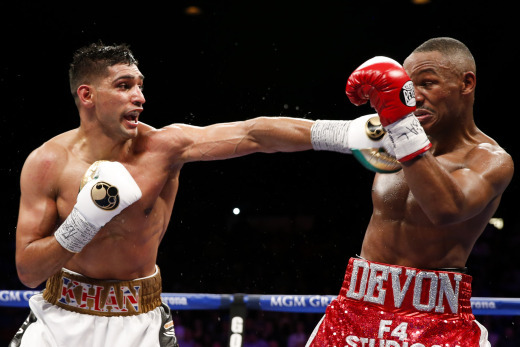 On Saturday, Dec. 13 in Las Vegas, Khan (30-3, 19 KOs) was dominant in a unanimous-decision win over Devon Alexander. The performance put the 28-year-old on the short list of future opponents for Floyd Mayweather Jr., the undefeated pound-for-pound ruler and top draw in the sport. On Tuesday, Dec. 16, Khan watched with the rest of the world as the horrible news broke out of Peshawar, Pakistan, that militants representing the Taliban stormed a school and killed more than 130 children. On Thursday, Dec. 18, Khan donated the shorts that he wore in the Alexander fight — featuring 24-karat gold thread in the waistband and estimated to be worth $47,007 — to the school in Peshawar. Khan is a Muslim Brit of Pakistani descent. “It was just very sad to see innocent kids being killed,” Khan told BBC radio. “I can only imagine what the parents are going through. I want to donate the shorts for the Peshawar cause, rebuild a school and strengthen security around the area. Because of the Taliban’s murderous and un-Islamic actions, the tragedy in Peshawar has — to the surprise of no one — led to more blanket stereotyping and negative backlash from media and the public against the world’s entire Muslim population. Of course they will overlook that the victims in Peshawar are mostly Muslim, and that the Pakistani government that the Taliban is fighting is mostly Muslim. Clearly this, like most similarly heinous and terrorist acts, is about politics more than it is about religion, since almost everyone involved claims the same religion. Pakistan is reportedly more than 95 percent Muslim. But you likely won’t hear that from any mainstream media source, nor will you see much attention paid to the generous actions of Muslims like Amir Khan who are trying to help in the healing. May Allah bring peace and His blessings to the families of the victims and the families of the misguided perpetrators, all of whom are surely in pain right now. May Allah open the doors of Paradise to the victims, and bring due punishment upon their attackers.